In 1979, a little movie directed by Don Coscarelli came out of nowhere to scare the heebie jeebies out of a generation. 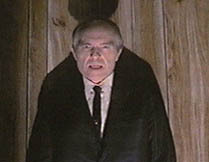 Phantasm is a stellar example of classic science fiction horror made on a low budget. Tommy (Bill Cone) is spending some time with a girl at Morningside Cemetery. (Credited as the Lady in Lavender and played by Kathy Lester.) His evening of passion is suddenly brought to a halt when the girl pulls out a knife and stabs him to death. 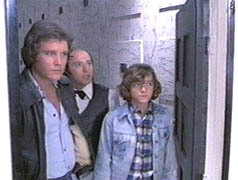 The young man was part of a trio of best friends, which includes Jody (Bill Thornbury) and Reggie (Reggie Bannister). Saddened by what they believe is their buddy's suicide, the two attend Tommy's funeral at Morningside. 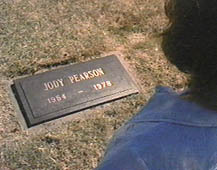 Jody wants to spend some time alone and enters the adjacent mausoleum to visit the spot where his parents are interred. He hears noises and sees a figure that disappears. 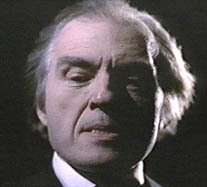 Somebody grabs him but it turns out to be an unusally tall caretaker (Angus Scrimm) telling him the ceremony is about to begin. Meanwhile, his little brother Mike (A. Michael Baldwin) drives his motorbike into the cemetery to watch from a distance. The boy was asked not to attend because he had nightmares for weeks after the deaths of his parents. Mike notices several small figures moving about the tombstones. 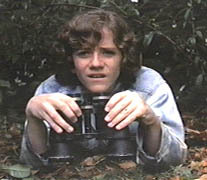 He then watches through binoculars as Tommy is buried. After everyone has left, he catches another odd sight: the caretaker takes the heavy coffin with Tommy's body and lifts it all by himself into a hearse. 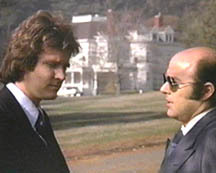 On his way home, Mike stops by the house of a fortune teller (Mary Ellen Shaw), where he is greeted by the old woman's granddaughter (Terrie Kalbus). Mike needs to get some insight into his brother, who's leaving him to jumpstart his music career. He recalls that while working on Jody's car, he overheard his brother talking to an old friend of his named Toby (David Arntzen). Toby was visiting to pay his last respects to Tommy. "I just don't get off on funerals, man. They give me the creeps," he had heard Jody tell Toby. Mike also heard him say that he plans on sending him to live with an aunt. The fortune teller tells him not to worry because Jody won't leave him behind. But there's another reason for Mike's visit. He says, "I was messing around up at Morningside Cemetery and I saw something ­ something really scary." He describes the action of the caretaker, the "Tall Man" if you will. The incident frightened him so much that he jumped on his motorbike and had a minor accident. The old woman produces a black box and asks Mike to stick his hand in it. He does - but his hand gets stuck and he panics. "Don't fear," he's told. The boy calms down and is able to get his hand out. The lesson? Fear is the killer and it was all in his mind. Jody is out on his porch, working on his music. Reg (who drives an ice cream truck) stops by and the two have an impromptu jam session. Meanwhile, the fortune teller's granddaughter enters the mausoleum. She opens a door where there's a bright light on the other side and screams. That evening, Mike watches as Jody picks someone up at a bar (the same "woman" who killed Tommy). They go to the cemetery and Mike gets his kicks observing them get somewhat intimate. The boy is suddenly frightened by a small figure (which resembles a Star Wars Jawa a little too much for comfort). Mike runs past his brother and the girl, interrupting their tryst. Jody chases after him and listens to the boy's unbelievable story. He sends Mike home and discovers that the girl has disappeared. Later, Mike has a nightmare that the Tall Man is standing over his bed...while two of his minions appear from out of the ground and grab him. The next day, Jody tries to find the girl to no avail. He wanders around the town and catches a glimpse of the Tall Man standing menacingly near Reg. While working underneath Jody's car, Mike hears funny noises. The carjack falls and the boy is nearly crushed by the vehicle. Jody arrives and Mike insists that the dwarfs were jumping up and down on the car. The boy packs a knife and heads out to Morningside, where he enters the mausoleum through a broken window. He's almost busted by one of the workers (played by Kenneth V. Jones) but manages to stay hidden. When the coast is clear, Mike wanders around the deserted halls. Suddenly, a speeding sphere comes at him and he runs. The worker grabs him but Mike bites the guy's arm and breaks free. At that moment, the sphere (with its two spikes) jams itself into the man's head. A drill then makes a hole right between his eyes. Massive amounts of blood shoot out of a hole on the other side. The Tall Man appears at the opposite end of the hall. He chases Mike into a room - where the boy manages to lock himself in, not realizing that the man's hand is jammed inside with him. Mike pulls out his knife and cuts his fingers off. An inhuman yellow substance spurts everywhere. The dismembered fingers are still alive on the floor and Mike takes one as a souvenir. He's chased by several dwarfs and narrowly escapes. Back home safely, he puts the finger in a box and falls asleep on the staircase. Jody wakes up and finds his brother with a loaded shotgun next to him. Mike shows him the box and Jody sees the finger inside moving. Mike tells him the story about Tommy's stolen corpse. Jody advises him to grab the "evidence" and take it to the Sheriff. When Mike opens the box again, the limb has mysteriously turned into a huge red-eyed flying bug! He wraps the unruly creature in a shirt and with Jody's help, they put it in the garbage disposal. The thing doesn't die so easily. Reg stops by and catches a glimpse of it. Of course, he demands to know "what the hell is going on." Jody leaves Mike with a loaded shotgun and heads for Morningside, also armed. He enters through the broken window and is immediately set upon by one of the hooded dwarfs. It takes several shots to keep the little guy down and Jody makes a hasty exit. Outside, he's nearly run over by a hearse with no one at the steering wheel. Mike drives by and Jody jumps in the car. But the hearse is on their tail. After a brief chase, Mike finally gets in a good shot and the hearse crashes into a tree. When he and Jody take a look inside, they see that one of the dwarfs was driving. They take the hood off the guy and to their surprise, the dwarf turns out to be Tommy! They call Reg from a phonebooth and ask him to bring his truck over. "Jesus, you didn't tell me the dwarf was Tommy," Reg says when he arrives (in one of the film's funnier lines). They remove the body from the car and padlock it in the freezer of the ice cream truck. Sitting by the fireplace, Reg, Jody and Mike try and figure out why someone is stealing bodies from Morningside and shrinking them down. Mike is dropped off at an antique shop run by a friend of theirs named Sally (Lynn Eastman). While looking around the store, he finds an old sepia-toned photo of the Tall Man on a horse and carriage in front of the cemetery. Mike tells Sally to take him home right away. Mike sees Reg's truck overturned on the side of the road from Sally's car. He opens the freezer and Tommy's body is missing. Back at the vehicle, he tells Sally to leave but a girlfriend of hers opens the door. At that moment, several dwarfs pounce on them. Mike is thrown out the back window and the car speeds off with the two girls. He races back to his house - where Jody has been sitting around in a trance. He tells his brother that Reg, Sally and her friend where all taken to Morningside. Jody is determined to rescue them and he locks Mike in his room. Mike is frantic and believes he'll never see his big brother again. Undaunted, he manages to find a way out and goes after Jody with a gun. When he opens the front door, he's met by the Tall Man who says, "I've been waiting for you," before shoving the boy in his hearse. Mike shoots at one of the tires and jumps out the window. The hearse crashes into a tree and explodes. 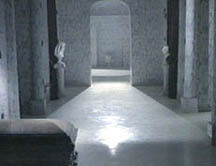 At the mausoleum, the first thing he does is open his father's coffin. The body is missing and he screams. Another silver sphere comes around the corner but Jody appears just in time and shoots it into little pieces. Mike shows Jody a door, where he believe something sinister is going on behind it. Reg shows up and tells them he was playing dead in one of the coffins. He also tells them he freed Sally and several other girls. Behind the door is a white room filled with barrels. Inside them are dwarfs about to be transported into another dimension. Mike falls through this dimension and sees dozens of dwarfs being led away into a bright red world. He's pulled back into the room by Jody and Reg. Mike is finally able to decipher what's going on. He tells them that bodies are being stolen so they can be taken into slavery on another planet. In addition, they've been shrunk because of the gravity and heat in the other dimension. The bodies in the room are set to go. Suddenly, the lights go out...and Mike and Jody both end up outside looking for each other. Reg accidentally activates the transporter, creating a vacuum that sends the barrels flying through it. He makes it outside...where he finds the Lady in Lavender on the ground. As he approaches her, she stabs him in the stomach with a knife. The woman then morphs into the Tall Man. Mike and Jody come up with a plan to lead the Tall Man into a nearby mineshaft and blow it up. When Mike goes back into their house to look for more ammunition, their pursuer breaks in and aggressively goes after him. Mike is nearly thrown off by several traps but remembers the fortune teller's advice about not having any fear. With this in mind, he runs towards the mineshaft and jumps over it. The Tall Man has no clue about this setup and falls into it. Huge rocks roll on top of the opening and he is trapped. Mike wakes up. It's all been a horrible dream. He tells Reg about it and says that the Tall Man has both his parents as well as Jody. Reg reminds him that Jody died recently in a car wreck and says that he will take care of him from now on. They plan to "hit the road for a couple of weeks" and Mike goes up to his room to pack for their trip. In a mirror, he sees an image of the Tall Man at the other end of the room...whose only word to Mike is "Boy!" as a pair of hands grab the kid and pull him through the mirror. 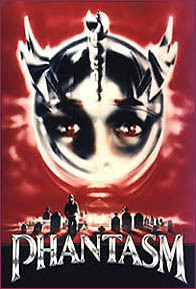 Phantasm is a very creepy piece of work that makes absolutely no sense at times. It's one in which you must suspend your disbelief and go with it...truly an original comfort food of the genre. Totally bizarre visuals, the sparse Tall Man and that damned freaky sphere are more than enough to warrant classic cult status for this midnight fave. The element that is most striking is its enduring appeal through originality; there still hasn't been anything like it and, considering the current state of horror films, there probably won't be anything like this for some time to come. Lesson to be learned here? A low budget, hard work, loads of imagination and an aspiring director who wants to make a truly outlandish horror film can combine to create a gem. Don Coscarelli was a fan of terror flicks and yearned to make one that was completely off the wall. His plan was to make a non-stop roller coaster thrill ride. To that end, he took complete control of the project (and besides directing) he co-produced it - and was also responsible for the cinematography, writing and editing. A one-man show all around! The film is helped immensely by the very eerie music of Fred Myrow and Malcolm Seagrave. It is one of the best horror scores ever, one that gets under your skin with its ominous organ strains. 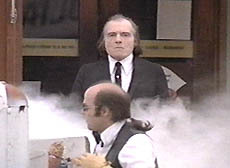 There would be three sequels to Phantasm, the first of which would materialize almost a decade later (in 1988). For all you trivia buffs out there, the house used as the outside of the mausoleum is also the home from Burnt Offerings.